While most people think of beaches, volcanoes and the lush rainforests of the national parks when they imagine a vacation in Costa Rica, there are quite a few cities that are worth visiting during your trip. Most of them are in the Central Valley in the center of Costa Rica. This region is the home of 3 three quarters of the population, even though it only makes up a fifth of the country’s area. The Central Valley is the center of commerce, industry and service. The cities may not be the most celebrated ones in Central America, but each of them reflect their own Costa Rican voice. When here, don’t forget to visit the famous coffee plantations! 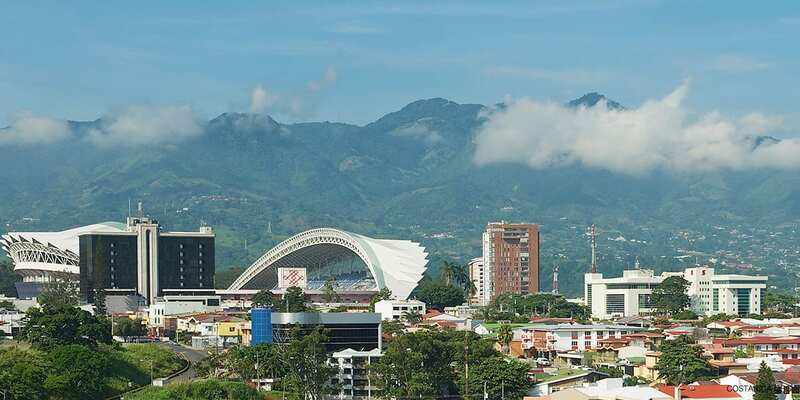 For most people, their vacation begins and ends in the capital city of San Jose, Costa Rica. This is where the Juan Santamaría International Airport is located and where the majority of the international flights arrive. More than a million people live in San José’s metropolitan area. Consequently, San José is by far the largest city in Costa Rica. It is located in the Central Valley, surrounded by mountains and volcanoes. The city boasts an eternal spring like climate year-round. In San José, you’ll find a wide variety of museums, restaurants, and points of interest. We recommend a stroll down the Avenida Central and a visit to the Teatro Nacional. Make sure to visit the National Museum or Jade Museum during your visit. Perhaps you would even like to take a city tour to learn all about San Jose’s fascinating history. From here you can take amazing tours like Irazu volcano, Poas volcano and Chirripo National Park – every one of them a place of immense natural beauty. You can also visit famous national parks such as Manuel Antonio and book some of Costa Rica most thrilling whitewater rafting tours – the most iconic one being on the Pacuare river. In the northern province of Guanacaste, you’ll find another important city – the town of Liberia. More and more flights are coming to Liberia’s Daniel Oduber International Airport these days. Many people choose this option to avoid the capital of San Jose entirely. 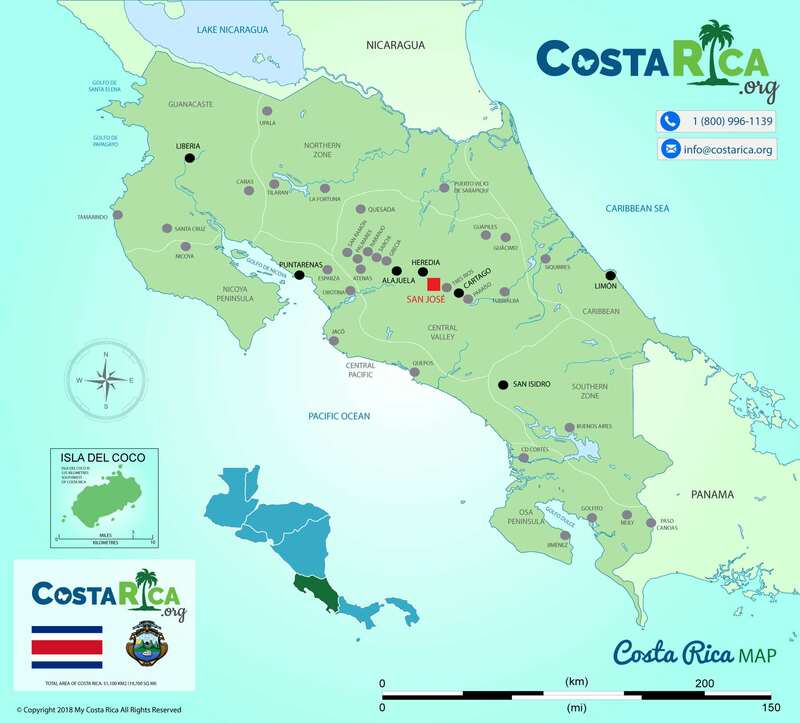 Here, you have easy access to some of Costa Rica’s most beautiful beaches, all inclusive resorts, and 5-star hotels. The region itself is one of Costa Rica’s most popular places for tourism. Guanacaste is home to the Rincon de la Vieja Volcano and Palo Verde National Park. Rincon de la Vieja is the best destination for a horseback riding and adventure tour. Go a bit further and visit Monteverde Cloud Forest, Rio Celeste or even Arenal! Monteverde is the best location for zip lining and night walks in the cloud forest while Arenal is known for its famous hot springs and waterfall. Rio Celeste is the bluest river you will ever see. The locals say that this is where god dipped his brush while he was painting the sky. Finally, two additional of note are the port towns of Puntarenas & Limón. During Costa Rica’s high season, cruise ships come into these ports nearly every day. Limón is located on Costa Rica’s Caribbean coast and has a distinct cultural identity and feel. Puntarenas is located on Costa Rica’s Central Pacific coast and offers access to the Nicoya peninsula by ferry to reach the beaches of Tambor, Santa Teresa & Montezuma. From Limon, don’t forget to visit the stunning Cahuita National Park for some world class snorkeling and Tortuguero where you can spot hundreds of sea turtles! Puerto Viejo is a colorful party town home to the stunning Playa Cocles. One of the best features of the cities and towns like Cahuita and Tortuguero, is that every day life and nature are far more entwined and the tropical rainforest, jungle exotic wildlife species like sloths are within close proximity.